The common belief is that Lakshmi (goddess of wealth) and Saraswati (goddess of knowledge) always fight and avoid staying in the same place. This is based on the observation that rich businessmen tend to be uneducated and educated people tend to be poor. This is also based on the assumption that Saraswati is the goddess of education, learning and training. This understanding of Saraswati is rather pedestrian, and lacks insight. The word Saraswati stems from the Sanskrit root ‘saras’ which means that which is fluid and can be either contained in a lake (sarovar) and made to flow as in a river (sarita). It refers to imagination.Human imagination is what enables humans to envisage future problems, hence innovate, invent, and most critically pass on learning from one generation to another. Every generation thrives by taking advantage of knowledge gained in the past. So there is continuous skill and knowledge upgradation in the human species which accounts for human civilization. Inherited wealth and lottery are the only cases where Lakshmi comes without Saraswati. A rich uncle dies and leaves behind a fortune for us. This is luck. We win in a casino. That is luck. We can call it the result of some past life karma or the grace of God. But in all other cases, we need Saraswati to get Lakshmi. Saraswati is all kinds of knowledge and skills. The better knowledge you have, the better skills you have, the more likelihood of you generating wealth. So the farmer grows food because he knows how to farm. A craftsman creates valuable products because he has knowledge of a craft. Saraswati is needed not just to generate wealth but also to retain wealth. So unless the farmer and the craftsmen have business acumen, they lose their generated wealth. They need to have knowledge of marketing and sales. They need to develop financial skills or have the knowledge of partnering with people with financial skills. A trader needs Saraswati, a banker needs Saraswati, even a housewife needs Saraswati – the knowledge and skill to distribute her money to satisfy all household needs and wants, both short term and long term. We narrow Saraswati to knowledge received in schools. But until modern times, we did not have schools in the modern sense of the term. We functioned using the apprentice model. The potter passed on Saraswati of pottery to his sons, the mother passed on Saraswati of cooking to her daughters. The better the Saraswati, the more successful the potter and the housewife. Saraswati thus has many forms – knowledge and skills that we can pass on through schooling and apprenticeship is the most prominent of them. But the one form of Saraswati that cannot be passed on is wisdom. Wisdom cannot be inherited or bequeathed. It has to be generated through reflection or tapasya. Absence of wisdom is evident when Lakshmi comes, and we don’t value Saraswati as much. We feel we have magically generated wealth and it will stay with us magically. Someone who is truly a student of Saraswati will know that fortunes are never permanent and we have to work towards preparing for future crises.There is no limit to Saraswati , ie a time when a person cannot learn more. Often we don’t trust home grown knowledge and believe knowledge exists only in formal schools and colleges, a common problem seen in small and medium sized family businesses across India who are sending their children to Europe and America to earn business degrees and find that the children either do not want to return home, or look down upon their family business (not fortune) as full of terrible practices. 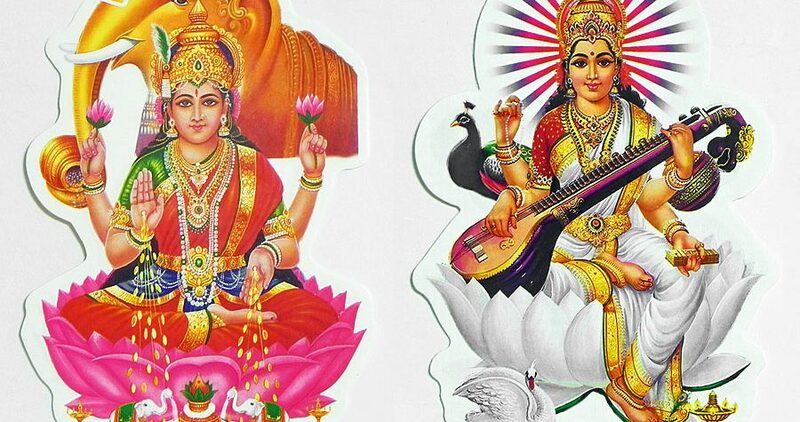 There is a folk adage: in good times Lakshmi walks towards us and Saraswati moves away from us while in bad times Saraswati walks towards us and Lakshmi moves away from us. The trick is to focus on Saraswati at both times. In boom times, she teaches us how to ensure sustainable growth. In bust time, she teaches us how to reverse our situation and make our way from misfortune towards fortune. Lakshmi or no Lakshmi, we always need Saraswati if we wish to survive or thrive.